Kalgoorlie Broadsheet: Stereo Aids - Manufacturers of Mirror and Pocket Stereoscopes. Publishers of 3D Imagery. Gold Mining In Kalgoorlie W.A. 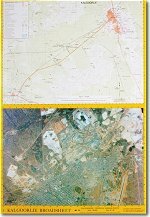 1:100,000 A3 size topographic map covering the area from Kalgoorlie to Coolgardie. 1 Oblique photo of the Golden Mile and Kalgoorlie-Boulder. 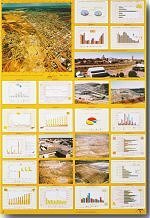 16 original graphs (pie, line, vertical & horizontal columns, climate, 3D) to show various aspects of gold mining and the impact on the environment. 7 ground photos showing various aspects of Kalgoorlie.